I loved finding these statues during our time in Berlin last summer. Each one was different. And I learned that the bear is the symbol of Berlin. 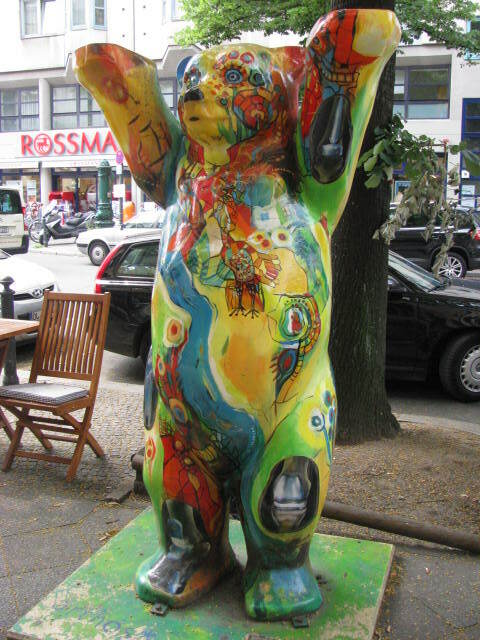 This entry was posted in Travel Photos and tagged 50 Year Project, Bears, Berlin, Blog, Blogging, Europe, Germany, Life, Photo, Photography, Symbol of Berlin, Travel, Travel Blog, Travel Journal, Travel Photo. Bookmark the permalink. Next time in Germany I want to explore the countryside more. I enjoyed Berlin, but I would like to be a little more adventuresome. It just didn’t work out that way last summer. It’s like the cows they had in Edinburgh on my first visit! I think I took a picture by at least 10 of them 😀 That one looks like it’s a Dia de los muertos bear! I still haven’t been to Edinburgh. Man I need to get on that. Dude, I saw that you guys are expecting more snow. Is that right? How much snow have you had? I don’t think we’ve had as much as that 10/11 winter but its been a lot. No idea how much we’re actually getting today. It’s one of those where there are forecasts all over the place from 1″ to 10″. So we’ll see. 1 -10 inches–wow they are covering all the bases with that aren’t they. Yeah. And no two can agree. Snowed over night but doesn’t look like much stuck except in cars and trees and stuff. Be careful. And enjoy it for me! Was it a bear parade? We have a cow parade in Manchester – it’s brilliant. Cows all over the place all in different colours or wearing hats, etc. My understanding is that they are always there, but I could be wrong. When’s the cow parade in Manchester? Most of them are. They were fun to find! In my state Tamil Nadu in India, during the harvest festival in January, the villages come alive with mock games and dances. One of them is called the tiger dance. A boy wearing just a loin cloth, is painted like a tiger and a long tail is attached to his rear, and he mimics or rather dances with tiger-moves. Children love him! I was trying to get a link to post it to you for the March 4th photo. No luck. I think I should photograph one live myself. I do want to come to India. At my last job every day during my lunch there would be a commercial on the television about visiting India and each time I wanted to book a trip right then and there! I hope to soon. And thanks for the youtube video! I enjoyed seeing it. Seeing traditions like these make trips memorable. awwww thats so sweet of you TBM. You watched it? That’s so cool. Do visit India and also visit my home. I am sure you will get the best hospitality of your lifetime there. A friend of mine spent a month in India for work and he loved it. I really can’t wait to explore India myself. I wonder if you would have to buy a plane seat to get it home. Security might be difficult. But so worth the trouble. I love it!! So interesting! Would the bunnies cuddle with him? What an amusing statue! Very vibrant! In this movie Kamal had double roles, one as a handsome man and the other as a circus dwarf. He took a lot of effort to essay the dwarf’s role and made it quite authentic. Thanks for much for the video. I enjoyed watching it this morning while sipping some tea and eating toast. I need to get some cds from India, I love the instrumentals and signing–so beautiful. I wasn’t expecting to see him on a bicycle. Is Kama Haasan an actor? do you recommend any of his films? Or am I thinking of a different man. Thanks again! Kamal Hassan is a very versatile actor. You can see many of his films on Youtube. “Nayagan” is about a Godfather in Mumbai. I think it made it to the Times list of best movies. “Aboorva sagodarargal” is about the circus clown. “Sadma” In hindi was a big hit. Actually, you should watch “Pesum Padam” which has no conversations at all. It was first of a kind film. Do watch it. Thanks for all of the suggestions. I love seeing movies from all over the world and I’ll add these, especially Pesum Padam, to my list. Thanks! i loved berlin – the east more than the west. my son lived there for two years after he graduated from college, working for a german music software company. there is a little park with a very old statue of a bear. it’s a lovely little space. How cool that he lived there for a couple of years. There’s so much to see there I would love the opportunity to live there.